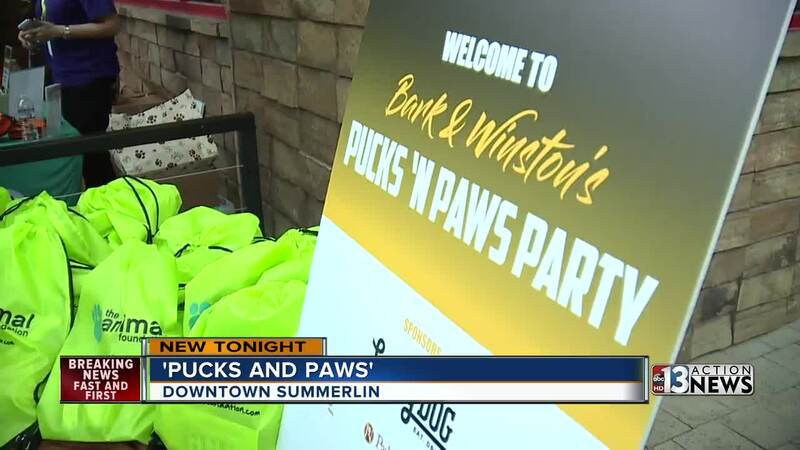 Hockey fans and dog lovers came together in one place and all for a great cause. Bark Andre-Furry and Sir Winston Da Doodle are the local "fur-lebrities" whose online following is truly Vegas born. Dori Arin is Sir Winston's owner.
" I love how many people out here love their dogs and are also fans of the Knights," she said. "It's just such a great crazy combination." All sizes, all breeds, and all Vegas Strong turned out for Pucks and Paws to benefit the Animal Foundation. Beginning with a short "sniff and greet" followed by an all star paw parade leading to a bring-your-own-bowl doggy buffet at Lazy Dog in Downtown Summerlin. "This is the most magical amazing event and it benefits so many good things," said Sherry Powell. The money raised will help raise awareness about shelter animals and other animal foundation programs. We all know that sports brings people together. You combine that with man's best friend and that equals a room full of people making a whole lot of new friends. "This is combining all the people I've been talking to on Facebook all in one spot, " said Powell. "Our families are involved by having our dogs involved." "It's a great opportunity for those of us who follow the Knights online and over the past year have got to know one another, " said Rick Williams. "We've known each other through our pets or Twitter accounts and never met face to face," said Paul Gold. It was a golden opportunity in more ways than one.